After my de-stash efforts earlier this week, I rewarded myself for my hard work with 12.5 yards of brand new, modern, lovely fabric from Pile O’Fabric and Hawthorne Threads to fill in the gaps in my stash. If you read through that whole list and picked up on the fact that I was shipped a wrong cut of fabric, I am amazed! The good folks at Hawthorne Threads worked with me, and the Scribble Notes in Black is on the way. It makes me sad that there is only one green print and no blues at all in this otherwise very beautiful rainbow bundle. However, there really is no room in my multiple blue and green bins for more fabric. And as it is, my pink bin is still almost empty. I hope that beyond some occasional backing yardage I will be set for a while… we’ll see. They are all simply beautiful! I did a little fabric retail therapy myself , Friday! There’s nothing like it! Good luck with the pinks! Lol, I should share a picture of the “pinks” that hopped into my pile Friday! Enjoy your Sunday! What a beautiful pile o’fabric! 🙂 These pieces will make lovely additions to your stash. What size cuts do you usually purchase? 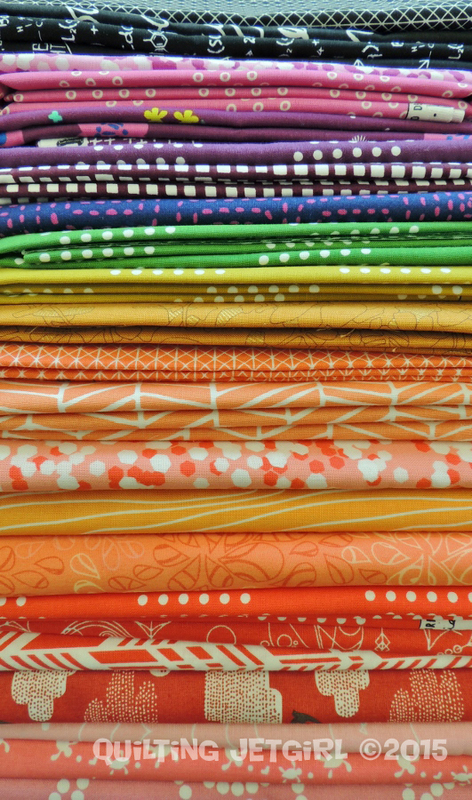 When I buy solids I usually get 1 or 2 yards, but I’m always confused about how much of a print I would like to have. You’re right. I didn’t read through the list. 🙂 But I did drool over the colors. Filling in color gaps is always a good move. Oh my, Yvonne. I kind of want to come roll around in your stash right now! I love that rainbow pile… there are so many good prints in there. I’m using a lot of them in my current project (especially the C&S Basics). I’d love to get my hands on some Mini Pearl Bracelet. But I’ve resisted ordering any on-line. If somewhere local had it, there’s no way I wouldn’t succumb! Those fabrics look v. luscious! Oooh I like those purples! And the feather orange one and the pinkish turtles! Good stash builders. I vote for you to share…I’m in love and oh so terribly jealous! Nothing better than looking at a rainbow! 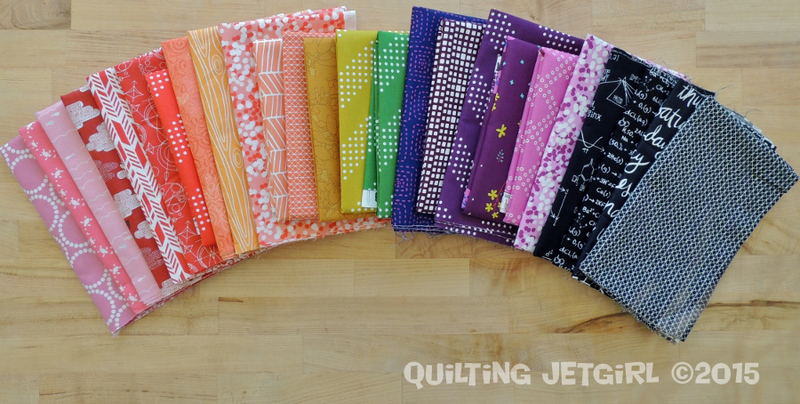 what a lovely bundle, it makes me want to go on a stash-acquiring frenzy! 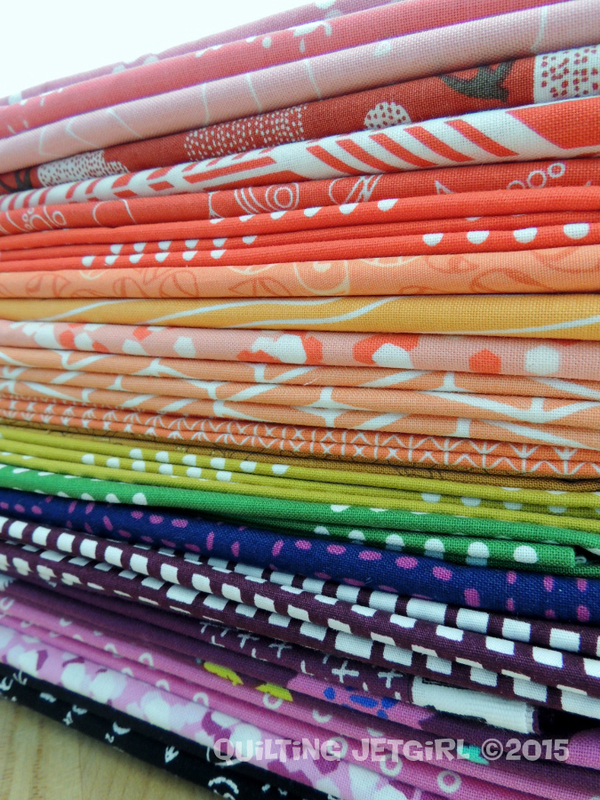 Wow that’s a delicious bundle of fabrics, 1/2 yard cuts are a great size. Let me know if you need pink. Never a shortage here. I think it breeds in the darkened cupboard. I have a few rainbow projects in the works – just love that colour scheme/ 1/2 yards are definitely worth it! What a beautiful bundle, any specific plans or just in case? One can never be set for good! Go forth and shop! What’s funny is that I just bought some Equations in Black and I love it 🙂 Your selection is fabulous, but you know me–I’m in love with rainbows and fabrics that read one particular color. Gorgeous stash additions!